In issue 129 of the club journal from the LCD e.V. 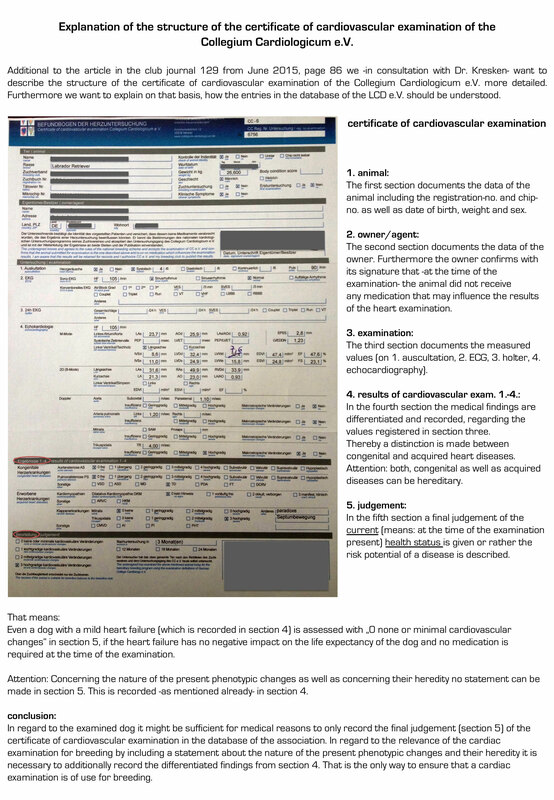 in June 2015 it is declared on page 86, that diagnosis from heart examinations only will be added to the data base of the club, if the certificate of cardiovascular examination of the Collegium Cardiologicum e.V. is submitted. Furthermore it is explained that – for database-related reasons – only the final judgement can be published but not a differentiated diagnosis. We think it is of great importance (especially in breeding terms) to be able to read and evaluate the CC-examination form properly. That's why we – in consultation with Dr. med. vet. Kresken – have submitted a statement on the structure of the CC-finding sheet with the request to be printed in the club magazine of the LCD.